Andy Warhol’s Soup Can, Edvard Munch’s Scream, and Vincent van Gogh’s Starry Night. Whether in a museum, on a postcard, or in a magazine, these are some of the most famous and well-known paintings ever created. But, chances are, you’ve never seen them like this before. Like many great ideas, this one came randomly and in an unexpected place—on an Iowa City bus. 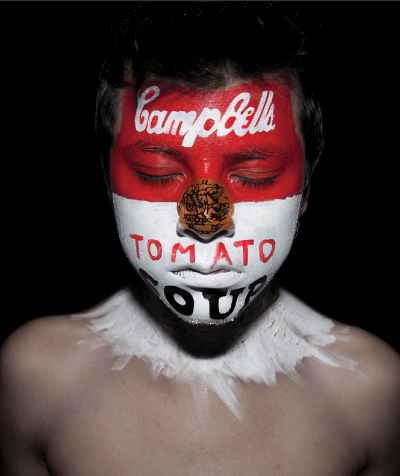 UI student Andy Alcala wondered: what if, for his final intermediate photography project, he reproduced several renowned works of art on his face and then took a series of self-portraits? And what if those face paintings paid tribute to some of the great artists he learned about in art history classes? Each face painting took between one to two hours to painstakingly reproduce in acrylics (Alcala painted in reverse, looking in a mirror). He also decided to adopt the artists’ specific techniques. While attempting to apply Jackson Pollock’s One: Number 31, he struggled to recreate the artist’s famed “drip effect.” In the end, he lay on the floor, dripping colors onto his face from a paint-filled plastic bag. For the Warhol, he recreated the silkscreen effect by placing a T-shirt over his face. Starry Night presented the biggest challenge, taking more than two hours to complete, partly because Alcala felt intimidated by trying to do justice to such a great work. After he’d finished the paintings, he spent another 30 minutes to an hour taking his self-portraits. Since he posted “FaceArtists” on his Flickr account, Alcala’s class project has become an international sensation, going viral in the social media world. One of his Flickr followers picked it up and shared the project on a social sharing site called Tumblr, which (like Facebook) attracts millions of users. Pretty soon, “FaceArtists” started showing up on various art blogs. The United Kingdom’s Daily Mail newspaper snagged the story, and Alcala has since learned that he’s been featured on German television and in a Taiwanese magazine. He’s also received Facebook friend requests from around the world and most of his Flickr portraits have attracted more than 1,500 views. It’s hardly surprising. After all, Alcala has a face that’s difficult to forget. View all the “FaceArtists” portraits on Alcala’s Flickr page at www.flickr.com/photos/26375062@N06.